Okay, you’ve used clear plastic as shelter and to collect water, what now? You lack a container to boil water in. Dig a hole, line it with plastic. 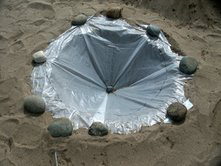 Now add water, fire heat a few rocks, and drop them in the water. Guess what? That hiss, that steam, and those bubbles mean you just made a little drinking water. Would the hot rock melt the plastic? Hot rocks can indeed melt the plastic even with water covering it. The trick is water depth, rock size, and plastic thickness. experiment with this. Practice it before your life counts on it.